PM Oli's India visit reaches bilateral ties to new height - Integration Through Media ....! Ramesh Lamsal, KATHMANDU: Prime Minister KP Sharma Oli’s State visit to India (April 6-8), has reached Nepal-India bilateral ties to a new height. The Nepali delegation following the visit termed that the visit was successful to reach the bilateral ties to the new height as both Prime Ministers had reiterated to move ahead forgetting the past bitterness and misunderstanding. While addressing a joint press conference with his Indian counterpart held after the conclusion of the delegation-level bilateral talks between the two countries on April 7, Prime Minister Oli had said that social and economic development, and building a prosperous Nepal were the goal and objectives of the government under his leadership. Prime Minister Oli had clearly shared Nepal’s priority and goals in different forums during his visit. Prime Minister had voiced that Nepal had a desire to develop the Nepal-India relations based on mutual understanding as a model relations. “Equality, justice, respect for each other and promotion of bilateral interest are the shared destiny of Nepal and India. The cooperative relations subsisting between the two countries would be further strengthened and deepened by means of peaceful coexistence,” PM Oli had shared. Prime Minister Oli had expressed the belief that the meetings and talks at the highest political level would take the bilateral relations to a new height and such talks would be significant in discussing on the various issues of the multi-faceted Nepal-India ties. 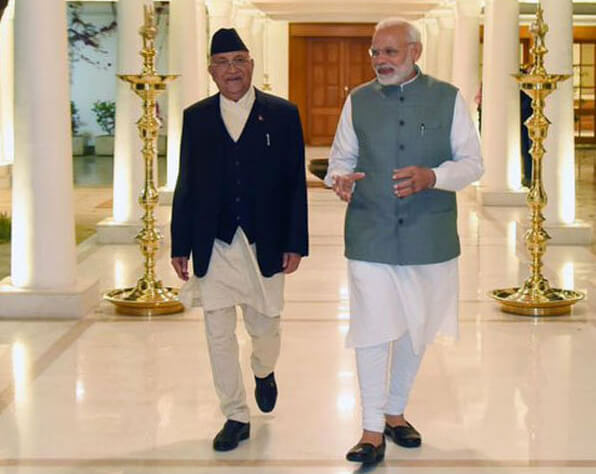 Making it clear that he has come on India visit to take the relations between the two countries to a new height and to explore opportunities of mutual benefit, Prime Minister Oli said he and Prime Minister Narendra Modi discussed the entire gamut of Nepal-India bilateral ties. The PM stated that constructive talks were held on all issues including the Eminent Persons’ Group (EPG) formed at the highest diplomatic level of both countries to fine tune all aspects of the centuries-old Nepal-India relations befitting the 21st century. Stating that the development and prosperity achieved by India in the last two decades is an opportunity for Nepal, he expressed the confidence that India would extend all possible support in his endeavours to making the Nepali happy and contended. Prime Minister Oli expressed hearty gratitude to Indian Prime Minister Modi for announcing to provide access to the sea for fulfilling his objective of including Nepal in the connectivity network through construction of physical infrastructure and the surface, sea and an air route which is expected to ease Nepal’s access to sea. Prime Minister Oli had further called for India’s private and public sectors investment in the production of power from the immense water resources available in Nepal which stands unutilised, he also stressed on providing impetus to the big projects like Upper Karnali, Arun-III, Pancheshwar, among other hydropower projects. Premier Oli said that Prime Minister Modi was agreed to make joint efforts for addressing the energy need of both countries, establishing the energy bank, constructing a new transmission line and controlling the problem of flood and inundation faced by the people of both countries. Similarly, Indian Prime MinisterModi had expressed his happiness through his appearance and body language as he had started his statement in the Nepali language, saying his slogan of “Sabka Saath, Sabka Vikas” or “Development of All with the Support of All” and his Nepali counterpart’s slogan of “Sambriddha Nepal: Sukhi Nepali” or “Prosperous Nepal: Happy Nepalis”, were complementary. The way of delivering speeches in the forum by both Prime Ministers were echoed significantly with diplomatic significance. Prime Minister Modi had said “Happiness, peace and prosperity of the people are our shared goals and we are focused on this alone. We will fulfill people’s aspirations, “adding that India would become a partner in Nepal’s inclusive development. Portraying the elections to the local level, province and the federal parliament as the biggest achievement of Nepal, the Indian Prime Minister said that Nepal has entered a new era in its political history. Prime Minister Modi had committed to supporting to the projects prioritized by government of Nepal. Indian PM Modi shared that both Nepal and India were agriculture-based countries therefore new agreement will be focused in agro sectors, livestock, soil test, and agriculture education. The experts have commented that if these sectors were developed properly prioritizing by both countries, agro sector would be promoted effectively. He had further mentioned that Nepal, a country of Mt Everest will now have access up to sea and India will cooperate for the same. PM Modi had concluded his remarks repeating that India will continue its support in education, health, physical infrastructure, defense, security among other sectors of Nepal in future as well. Talking to RSS correspondent, the PM Oli claimed the visit had been successful in building the mutual trust by completely removing misunderstandings between the two countries. There were rumours that democracy was at risk in Nepal or it wanted to throw a card towards neighbours which had now been completely wiped out. He was of the view that his special meeting with his Indian counterpart held Saturday had taken the Nepal-India relations to a new height. The PM said that the visit has developed environment of confidence from the process to develop Raxaul-Kathmandu Railway Service, transporting goods to Nepal via the route of Ganges River and India’s promptness to support Nepal. According to him, Nepal’s gesture as a sovereign nation and its policy of non-interference and Nepal’s capacity to take its decision on its own was exhibited during the meetings with Indian President, Vice President and Prime Minister. The PM argued that the visit prepared a basis for establishing Nepal-India relations on equal footing, mutual interests and respects to suit the changed context of the 21st century. He said that the respect shown by India towards Nepal government has wiped out various rumours. A joint mechanism would be formed to forward past agreements inked between the two countries. Indian private sector, as he said, was ready to invest in Nepal. During a press meet organized at the VVIP Lounge of Tribhuvan International Airport upon his arrival with the completion of 3-day State Visit to India yesterday, PM Oli said the bilateral agreements relating to railway, seaway and agriculture were significant for Nepal. “In the present changed context, I held open and cordial discussions with Indian leaders keeping in centre Nepal’s interest,” PM Oli said, arguing that the agreements along with the joint statement would provide guide to future. The two countries, as he said, were keeping in priority the issues of expediting the Pancheshwor Multipurpose Project and effective implementation of the power trade agreement. According to him, he raised the issues as how Nepal’s trade deficit to India could be reduced. Similarly, the PM informed that he put forth the pressing problems of floods and inundation in border. Moreover, PM Oli expressed confidence that positive discussion was held on providing additional air route points by India, easing of the operation of Nepali gas bullet. He put forth clear views on making effective the regional and sub-regional forums as SAARC, BIMSTEC and BBIN. During the three-day visit, the PM called on the Indian President, Vice-President and his counterpart with the clear message that Nepal as a sovereign and independent nation believes in the policy of non-interference and is capable of taking decisions regarding to its internal affairs independently. Leaders of various political parties in India met with him and exchanged views on bilateral issues. During his meeting with his Indian counterpart Narendra Modi, the Indian Prime Minister praised the latest political achievements of Nepal and felicitated PM Oli for his election on the post by the third fourth majority of the House of Representatives, wishing for his successful tenure. The Indian Prime Minister expressed his confidence that the bilateral relations between two countries would go ahead on a new basis. Likewise, during his meeting with Indian Home Minister Rajnath Singh, the Indian Minister expressed his concern over Nepal-India border issues. Both sides have agreed to work collectively to enhance capacity of security forces of both countries and main peace and order along the border. The Indian government has attached priority to the issue of extending rail service from Raxaul, India to Kathmandu, pledging support to increase Nepal’s access (as a landlocked country) to sea/ water transport and the areas of agriculture and technology and these would obviously help Nepal find its easier path for its journey towards economic prosperity, said Foreign Minister Pradeep Kumar Gyawali. Chair of Federation of Nepalese Chambers of Commerce and Industry, Bhawani Rana, who was also in the PM delegation said the Indian side responded the Nepal’s call for further investment in Nepal positively. In view of House of Representative member Rambir Manandhar, calls for investment in Nepal and bilateral understandings to this regard have provided the ground to believe that the Prime Minister’s India visit was completely successful.